Successfully Added 7 Inch Car LCD Display - 800x480, 4 Camera Input, Split Screen Display to your Shopping Cart. 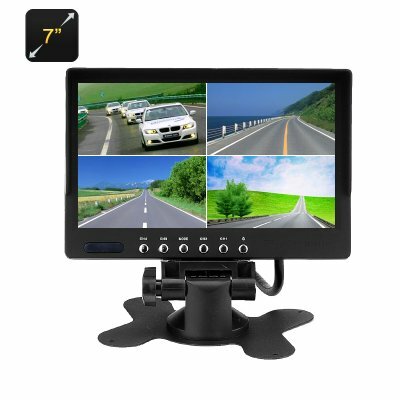 This fantastic 7 inch car TFT LCD display brings you 800x400 resolutions and can support 4 video inputs that can all be seen at the same time on a split screen display. You can hook up rearview cameras, DVRs and frontal monitoring cameras as well as an input from your DVD player or GPS system. This will let you reverse and maneuver tight spaces with ease as each camera feed can be shown individually or simultaneously depending on your need. You won’t even need to change channels as once installed this car monitor can automatically switch to the review camera when you put your car in reverse. Not only will this monitor take the headache out of parking it can also bring your GPS a fresh big screen look as the 7 inch display makes shows greater details so you can following directions and navigate to your destination without having to squint at a small screen and moss your turning. For in car entertainment you can hook up your DVD player and passengers can view movies from every seat with the monitor’s wide viewing angle which will shorten the time of those long journeys. It can be mounted on the dashboard or central consol of your car and is full adjustable so it can be rotated to find the best viewing angle. This 7 inch car display comes with a 12 months warranty. Brought to you by the leader in electronic devices as well as wholesale TFT LCD Car Monitors, Chinavasion..